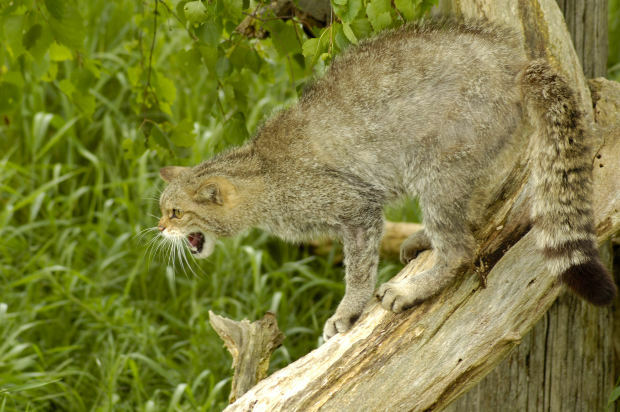 Cats hiss and spit at those they want to drive away – other animals or people. Young kittens are capable of hissing even before their eyes have opened. Thus, the behaviour is innate rather than learned. Hissing is a threatening gesture designed to trick the watcher into subconsciously associating the cat with a dangerous snake. A hissing cat flattens her ears, creating a face shape much like that of a poisonous snake. Often, the cat’s fur will stand on end and she will arch her back to make herself appear bigger and more capable of inflicting damage. Cats aren’t the only creatures that use mimicry this way. There are many non-poisonous insects that have markings similar to those of poisonous species to trick potential predators into thinking that it would be far too risky to take a bite. Insects may also mimic less tasty species or faster moving species that are difficult to catch. Some butterflies and fish also have markings that resemble eyes on areas other than their heads to trick predators into biting the wrong spot so that the prey can escape. Reference: Morris, D. (1997). Cat World: A Feline Encyclopedia. New York, NY: Viking Adult.